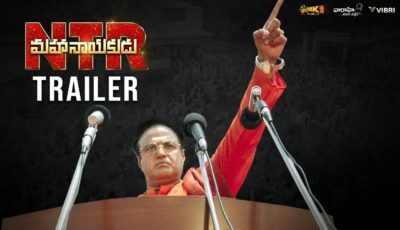 We have to warn and ask the fans of Nandamuri NTR (legend) and good samiritans in telugu film lovers to not allow any kind of hate oriented-false maligning, at this junture of movie releases of NBK and NTR. This has happened during the last 1 and 1/2 year. 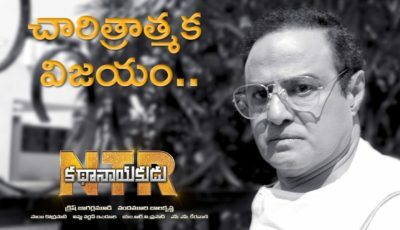 NBK was framed for attempted killing on the eve of his making of “Nartanashala” and all the NTRâ? ?s movies were pre-reviewed and maligned to be bad movies even before they were released. This was evidenced by almost all the NRI run web sites. So let all the telugus be careful as this is no win situation for any one. EVARINA CHOOSUKO NANDAMURI KAASKO.NANDAMURI ALWAYS THE CHAMPIONS. REALLY PROUD TO BE A NANDAMURI FAN. nagaraju good photo.thank u.i love balayya. balayy merru oka goppa hit sadisharu. I am vamsi krishna chowdary from Khammam sir.Sir,i think you will remember me.Sir i will meet you in your office on 15-11-2005 sir.Sir i told a story to you sir that is CHANIKYA SIMHA & some dialogues also i will told you sir.Then you told me the story was not suitable for BALAYYA BABU at present time.So you donot want to ready to take my story sir.But i will ask you please take atleast one dialogue .Then you prommised me you will take my dialogue if it is suitable to the story.You told me contact your P.A. Venkanna babu garu .Sir i contact him but he told me the story and the script will ready so there is no chance to take my dialogues so try again. Sir, i donot want to become a good writer.Sir, i want to become a good NANDAMURI fan.Sir i donot need money.One and only my life aim is to see a dialogue from BALAYYA which is writen by me.So please give me a chance in after BALAYYA film sir. Sir,any time sir i will ready to come sir if you will give a chance sir.Sir please give a chance sir. My phone number:09440528744 , 09441506606. Sir,i wish you a good luck to BALAYYA film sir.please give me a chance sir.sir VEERABADHRA SONGS are EXCELLENT sir i think it got a new record in telugu film industry like muddula mavayya &samara simha reddy&narasimhanaidu.Sir i want to come hyd on 15-4-2006 so sir please give a chance to meet next BALAYYA film director please give me a chance.sir please replay to me i am able to come hyd on 15-4-2006 OR not.